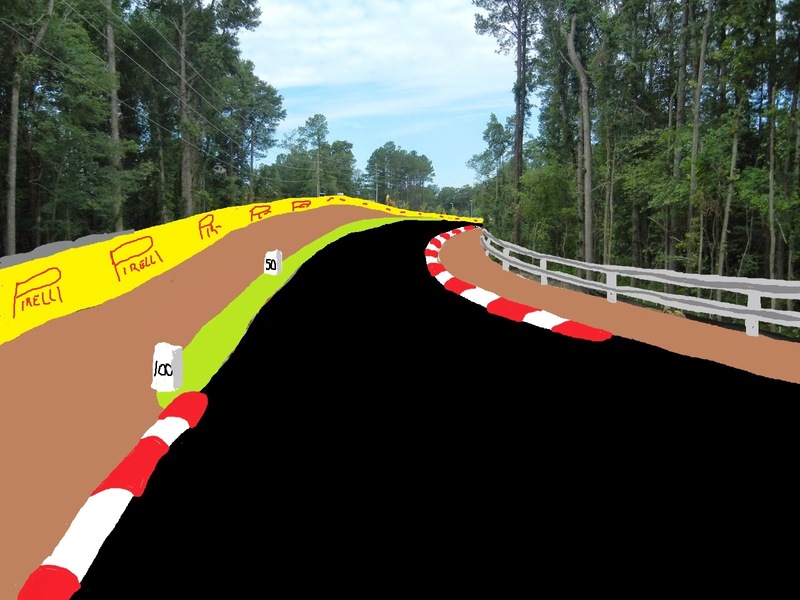 Nixon Motor Sports: Dead Man's Curve Update: PAVEMENT! It's been a few weeks since we showed you the current state of a safety upgrade on Rimer Pond Road.. AKA...Dead Man's Curve Part 1, the section I call Dead Man's Curve, so let's take a look at how it looks now. The first photo is from right near where I live, just a little reminder that it takes months to make these kinds of changes to roads, but in the end the increased safety should make it all worth it. Starting in the east, we're going to walk westward (like Columbus sailing the ocean blue) down the graded dirt path, and just maybe we'll find some new fresh pavement along the way! Remember that we're heading downhill here, and up ahead you can see that there has been more grading and clearly showing where the future pavement will be. The old road was straight ahead on the right, close to the tree line. The port-o-let probably won't be permanent! Ahh, freshly graded dirt! Great for walking and running on. Judging by the tire tracks, a few of the locals have been driving thru here too. Everybody wants to drive on a new road! Still going downhill, approaching what will be a kinder gentler curve, instead of the previous abrupt almost 90 degree tight bend. Safer, faster, smoother, sounds like a new razor from Gillete! Since we're approaching from farther to the left, yep, it will be a smoother curve, and probably result in cars able to go faster here. As long as the road is designed the right way, faster can be safer...otherwise I guess the national speed limit on interstates would only be 10 MPH. You can see above that the construction guys have parked their vehicles like this on the weekend to prevent traffic from coming thru here. Not 100% effective, and I'll show you why in a few more photos when a driver snuck up on me! Up ahead you'll see the new pavement! BLYTHEWOOD GRAND PRIX OF SOUTH CAROLINA! Right about here we're at the lowest part of the section, heading uphill. The corner up ahead is still going to be partially blind, meaning we can't see all what's coming up. Can you smell the ashphalt? A quick glance to the right shows you the small lake close to the road. Scenic view while I'm walking, but not recommended for viewing while driving a tricky bit of road. At the top of the hill, we have an improved view of the next curve to the right! The old road is now over on our left. A quick look to the left as we go by the church. I guess they will have to extend their driveway since the road is now farther away. Just over the hill and now we can see the end of the construction zone...and the day I was taking this photo was 1 day BP (Before Pavement) right about here the guy kicking up dust came up from all the new road we just walked. Not sure how he got his SUV and trailer thru the tractor that was blockinthe road, but he did it! The latest word I've seen is that the road will open again in October, so that will certainly make life a lot easier for those of us that have been taking the detour for several months. At least the guy that cut thru the construction zone put the "ROAD CLOSED" barriers back in place after he went through! One last look back, and yes Virginia, there is new pavement down there!